Most of the information that you need about Junior programs is available on our web site. For additional information, please contact Chip Liefert, Junior Development Chair at cliefert@hotmail.com , 414-248-4435 or Linda Freedman, marketing coordinator at lssf1@aol.com or 414-352-9728. All Tournament Directors should use the Midwest Section Standings List 1st & then the	Wisconsin List. The Coaches Guide for Junior Tennis is a 41 page printable guide published by the USTA/Midwest Section. It contains a wealth of information regarding all aspects of Junior Tennis. Please click on a link on the left, under Juniors, for the information that you are looking for. From time to time, timely information will be posted on this Juniors Home page. 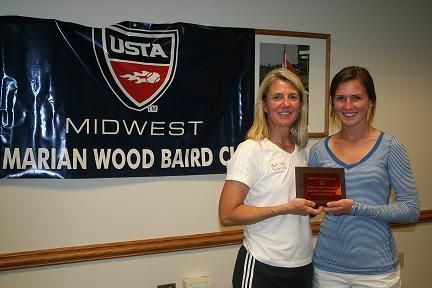 After 57 years of play, the Midwest Tennis Association’s Jr. Wightman Cup competition was renamed this year in honor of Marian Wood Baird, a long-time USTA volunteer and leader. For the 19th consecutive year, the event was held over three days in June at Ball State University in Muncie, Indiana. Each of the fourteen districts in the Midwest Section was represented by a team of eight or more young ladies age eighteen or less, including our Wisconsin team. By finishing second in our four-team pool, we landed in a playoff with Western Michigan for the chance to play in the semifinals. Although we split the six singles matches, we were unable to capture the pivotal doubles point and lost the match 4-3. Our final match was a playoff for 5th place versus Central Indiana, which we lost 0-7. A tough way to end a good weekend of play, but the girls all put forth great effort in losing to a better team. As always, the sportsmanship and attitudes of the Wisconsin players were exemplary, and the team was a pleasure to chaperone and coach. In fact, Caroline Starck, two-time defending Division 2 WIAA State Singles Champion, was bestowed the event’s highest honor – she won the Leann Grimes Davidge individual sportsmanship award. Voted on by the players, this award distinguishes Caroline among the roughly 120 girls in the competition, and she certainly is deserving. I’d also like to thank former team member, Hayley Homburg, who was a great asset in her role as Assistant Coach. I look forward to coaching the team again. The U14 Wightman/Davis Cup Competition will be held in West Lafayette, Indiana this summer at Purdue University. The dates will be June 14-17,2007. 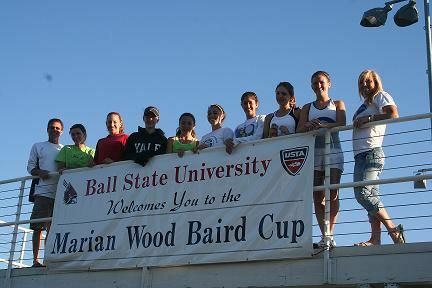 The 56th annual Jr. Wightman Cup competition was held at Ball State University in Muncie, Indiana from June 17-19. Each of the 14 districts in the Midwest Section was represented by a team of eight or more young ladies age eighteen or less. By virtue of a tough 5-2 loss to Northern Indiana (we lost two three-set singles matches after winning each first set), Wisconsin finished third in its 6-team flight. While a win would have put us in a playoff for third place, the loss put us in a position where we could finish anywhere from 5th to 8th, with that determination coming from the committee in a few days. I’d also like to thank former JWC team member, Mallory Voelker, who was a great asset in her role as Assistant Coach. I look forward to coaching the team again. Finished in 6th place. Coach Chorney commented that his team was rewarded for having the highest winning percentage despite being the strongest division. Teams comprised of the best 18 and under girls from each district participated in the event held June 19-21 at Ball State University in Muncie IN. Team selections are made by the WTA Junior Development Committee and the Wightman Cup Coach. "Our trip went very well, as usual. Due to a lack of depth, we finished between 7th and 9th, depending on the won-loss percentages to be calculated later. Other than some strong winds on Saturday, we had excellent playing conditions and beautiful temperatures the whole time." Western Michigan University played host to the 2008 District Team Cup competition. Kalamazoo and Western Michigan is rich in junior tennis tradition as it plays host to the USTA Boys 16’s and 18’s national championships each summer. WMU has recently upgraded their facility and we were able to play all of our matches at one site. This year’s team had five new faces with only three players returning with experience from last year. The 2008 team members included Billy Bertha, Nick Buckley, Brandon Debot, Sam Ecker, Connor Gilmore, Knute Gundersen, Drew Lied, and Jonathan Schwerin. This year’s team was seeded fourth, and looked forward to the challenge of winning the event. The team got off to a very strong start on Friday by sweeping Northern Indiana and Northwest Ohio. Every team member contributed on the first day in both singles and doubles without losing a set. Every player competed very well with great attitudes which helped us get through the first two matches quickly. Playing six singles matches and six doubles matches in three days can be very grueling, and conserving energy is important if you want to have a chance to win the cup. Our second day of competition was equally impressive as we shutout Northern Michigan and defeated a very good NE Ohio team 6-1. We swept the doubles in both matches and only lost one singles match. Nick Buckley dropped a tight three setter to Tommy Marx. I was very impressed with Nick’s fight throughout the match as he saved match points in the second set to force a third set. He competed extremely hard, and represented Wisconsin very well despite his loss. Once again all eight players contributed to the successful day. We knew things would get more challenging in the semi finals vs. the number one seeded Chicago on Sunday. I really felt we had a very good chance at Chicago if we could pull off the doubles. Billy Bertha and Jonathan Schwerin won a close match at number one doubles, but we were unable to pick up a victory at two or three. Billy picked up a win for us at one singles for our lone point as we lost the match 1-6. We didn’t have much time to regroup as we took the courts an hour later for the third and fourth playoff match vs. the seconded seeded Western Michigan Team. We got off to a strong start by winning the doubles point, and then we got pushed indoors due to weather for the singles portion of the match. Billy Bertha and Drew Lied picked up singles victories for us, and Jonathan Schwerin lost a three setter that would have given us our fourth point needed for the win. We lost 3-4 and ended the tournament in Fourth place. Billy Bertha and Jonathan Schwerin won all six doubles matches at the number one spot and Billy also won all six of his singles matches at the top as well. This year’s team was very enjoyable to coach and we had a great group of kids. I would like to thank our two seniors, Knute Gundersen and Jonathan Schwerin, and wish them well as they head off to college in the fall. Kalamazoo College played host to this years Boy’s Junior Davis Cup. The event was held over three days, and was played at four different sites. Kalamazoo College is rich in tradition as it is the host for the 16 and 18 Boy’s Nationals every summer. Each team was scheduled at the historic Stowe Stadium for at least one match, which was nice for all of the participants. This year’s team had several new additions, but we had some veterans that were able to play at the top of our lineup to give some of our younger players a chance to gain some experience. The 2006 team members included Brandon Bayliss, Billy Bertha, Matt Clegg, Michael Dierberger, Patrick Dwyer, Josh Graves, Jack Schiro, and Nelson Vick. We arrived in Kalamazoo as the number 4 seed for the second straight year, and looked forward to the challenge of winning the Cup. The team got off to a very good start by beating a very scrappy Northwest Ohio in the first round by a score of 6-1. Nelson Vick got his JDC career off to a nice start by picking up a win in both singles and doubles. We then played Northern Michigan later that afternoon and picked up our second straight win by a score of 7-0. Both Billy Bertha and Brandon Bayliss played well picking up their first JDC wins. Every player competed intensely which got us off the court relatively quickly. We were able to play all eight of our players on the first day. Conserving energy and players is extremely important in the Junior Davis Cup. We knew things would heat up on the second day of the competition. First up on the second day was Middle Illinois, and we were victorious once again by a score of 7-0. This was our first chance to play a match at Stowe Stadium, and our guys enjoyed the opportunity. We were able to rest Dierberger which allowed some of the other guys to step up and play higher in the lineup. We faced Seventh Seeded Central Indiana in our fourth match of the event. Central Indiana held out their best two players in their first match of the day against Chicago to gear up for our showdown. I really felt like we played a very clean match against Central Indiana to claim a 7-0 win. It was a total team effort that propelled us into the Semi-Finals. Chicago was loaded with depth, and on paper, was clearly the best team at the event. We knew that we would have to play really well to have a chance to beat them. We got off to great starts in doubles, but we were unable to close out the doubles point. Josh Graves teamed with Nelson Vick to win at third doubles, and our number two team of Matt Clegg and Billy Bertha had chances in a 9-7 loss. Michael and Patrick also had opportunities at the one spot after being up a break early they were defeated by a very good Chicago team. We headed into the singles down 0-1, but I feel that our guys came out ready to play. Patrick continued his hot play winning at the number two spot in straight sets. Nelson Vick played a very good match for us at number six singles winning 6-0 in the third set. Josh was in a battle at number two but lost in two very close sets. Billy Bertha also had a lot of opportunities but ended up falling in a hard fought match. Overall, I was pleased with our team’s effort and results against Chicago. We turned right around to play number three seeded and defending champions Ohio Valley for third and fourth. The match was moved indoors due to inclement weather. Dierberger and Dwyer got off to a great start by playing some of their best doubles. We were able to capture the doubles point with wins at number one and number three. Graves and Vick played another great match to clinch the doubles point for us. Dierberger, Dwyer, and Graves got off the court with straight set wins to capture third place for Wisconsin. Bayliss ended the match with a win at the number six spot making the final score 5-2. I would like to personally thank our seniors Matt Clegg, Michael Dierberger, Patrick Dwyer, and Jack Schiro on a job well done, and wish them well in their collegiate careers. The team came in 4th place this year, the highest finish in the last 3 years. Had many matches that went to three sets in the semis so the team was quite competitive. The best of the 18 and under boys in the Midwest Section competed at Michigan State University in East Lansing MI June 19-21. Each of the 14 districts sends a team to compete at this annual event. Team selections are made by the WTA Junior Development Committee and the Jr. Davis Cup Coach. "The trip went well. We were in the red division of the round robin with three other teams. We beat Northern Indiana and Southern Illinois 7-0. We lost to Ohio Valley 0-7. They went on to win the Davis Cup. Finishing second in our group put us in the top playoff group. We then lost to third seeded SE Michigan 2-5. It was a close match that really could have gone either way. Then on Monday we lost to NE Ohio 2-5 and lost a three setter at number one and at number six." 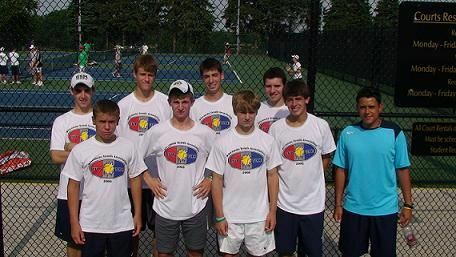 The Wisconsin Junior District Cup 14’s Team placed 2nd at the Midwest	(JDC) competition at Purdue University June 13-14. The team was seeded 4th going into the competition and ended the weekend with a 2nd place finish. The team began the tournament on Friday with convincing wins over Northern Michigan 9-0 and Northern Indiana 7-2. On Saturday, Team Wisconsin started the day with wins over Northwest Ohio 9-0 and an 8-1 victory over Northern Illinois. That set up a show down with #1 seed Ohio Valley. In the four years of competition, Team Wisconsin has never defeated Ohio Valley at the JDC competition. The team came out strong sweeping the boys, girls and mixed doubles. The most exciting match was the girl’s doubles. Karyn Guttormsen and Sophia Lococo were down 7-2 15-40. The doubles are 8-game pro sets. Karyn and Sophia managed to tie up the match and end up winning in a tiebreak. Team Wisconsin ended with a 5-4 win and a spot in the final. We ended up playing Central Indiana in the final. They played well and came out strong. We ended up losing the match 7-2 but the team played well. Congratulations to everyone who participated. A special thanks to Assistant Coach Tom Ewert for an outstanding job! The youngest traveling team from Wisconsin traveled just south of Indianapolis Indiana to Greenwood, IN to compete in the Midwest Jr. Davis Cup. Eleven of the fourteen Midwest Districts were represented with a minimum of 3 boys and 3 girls per team. Traveling with four boys and four girls to compete Wisconsin arrived to find that they were the number two seed. Six rounds of play stood between the team and the championship. Rain prevented the second round on Friday, forcing the players to play three rounds on Saturday making for a long day. The players’ stamina prevailed as they played strong the entire day, going 5-4 against Northern Indiana, 9-0 against Northeast Ohio and 9-0 against Northwest Ohio. Sunday morning was the semifinal match and after a goodnight sleep the team prevailed against the number 3 seed, Southeast Michigan, 7-2, to earn their place in the championship match. Mixed doubles clinched a point early on, while boys doubles fought back from a 0-5 deficit but lost in a tiebreaker. Our highest ranked girl faced a tough match against the number one ranked player not only in the Midwest but also the nation. We secured two more points at the number two and three girls singles positions. The boys fought hard but could not obtain anymore team points and we lost 3-6. Central Indiana had a strong team and all the players regardless of the outcome enjoyed the high level of competition. A second place finish was a great accomplishment for the team. Off court the team bonded throughout the weekend and showed great support for their teammates and good sportsmanship to other teams, coaches and officials. This being my first year coaching the team I could not have imagined a better group of kids or outcome and look forward to coaching next year. I could not imagine doing this by myself so I owe a thank you to Karlee Miller, as well as Mr. Bellissimo for his tournament travel expertise. We had a great weekend in Springfield, Ohio June 15-18, 2006. The team ended up with a 3-2 overall record. We won our pool defeating Middle Illinois 5-4 and Southeast Mighigan 5-4 on Friday. On Saturday morning we played Northern Michigan and came away with a convincing 9-0 victory. Our next opponent was Western Michigan who placed second in their pool to Chicago. If we win the match, we would play Chicago and have the opportunity to play in the Championship match. The match was hard fought but we came up short 5-4. Everyone played their hearts out. The team had suffered it's first lost. We were bit down but ready for Sunday morning's 5th and 6th place match against Southeast Mighigan. Another great match but we lost 5-4. Our 2 losses came down to 3rd set tiebreakers. Not to worry. We had a great trip back. The kids were tired but managed enough energy to sing and laugh on the 8-hour trip back to Wisconsin. I would like to THANK the WTA for all of it's support. Art Santos, John Jansky, Lloyd Cook and Nancy Massart Thanks. Tom Ewert (Assistant Coach) for all of his help and hardwork. The kids. You worked so hard and represented Wisconsin, your parents and communities so well. Team Members:	Billy Bertha, Nelson Vick, Sam Lillie, Jon Schwerin, Kayley Carswell, Katie Reinders, Caroline Starck, Rachel Vrabec. 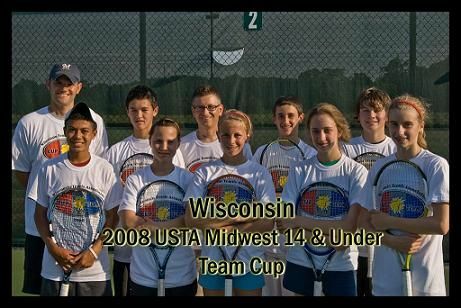 2004 marked the debut of the USTA/Midwest Section Jr. Davis Cup and Wightman Cup for the 14-and-Under Division. Co-ed teams comprised of the best 14-and-Under boys and girls from the 10 of 14 districts participated in the inaugural event. This event was held at Wittenberg University in Springfield OH from June 19-21. "The trip went excellent! The kids ended up taking 4th overall out of 10 teams. We beat Northern Indiana and Middle Illinois on Saturday 7-2. Lost to Northeast Ohio 5-4 on Sunday and lost to Ohio Valley 7-2 on Monday for the 3rd and 4th place match. Everything went smoothly. The kids and parents loved the fact that the WTA was picking up most of the expenses. The hotel was nice. Wittenburg University was nice. Everything I felt was a class act. Great Job!" Damon Niquet and Aly Coran played #1 for us and both did not disappoint. Damon won all of his singles matches and Aly came through with a key win in doubles to propel us past Ohio Valley. Griffin Pils went undefeated for the weekend and teamed with Josh Cogan in leading our team on the court with great intensity and off the court with great team spirit. Alex Jesse, Sophia Lococo and our most improved player Karyn Guttormsen played hard and came through with some key victories. Jessica Tang's on court demeanor was instrumental in our team sportsmanship award. We ended up in our bracket tied with both Ohio Valley and Southeast Michigan for the top spot. However, through a tiebreaker(percentage of sets won) we came out on top for the right to play Chicago for the championship. Going into the finals I felt we had a great chance to win but giving everything we had to get there caused us to come up short. Enclosed you'll find several photos courtesy of Noelle Muceno. Both Noelle and Jessica Lococo were awesome in helping me over the weekend. I know all of you know how difficult traveling to tournaments is for one child but eight kids is a lot of work! Noelle and Jessica came through time after time to make my job easier. Also, I would like to thank my assistant coach Dana Larsen. Her calm demeanor, tennis smarts and go between with the kids helped so much. I encourage all of the parents to contact me regarding your child's performance. I have some insight that may be beneficial to your child's development. I've already had a chance to talk to one coach and he found my comments very helpful. Thanks is in order to the WTA for supporting this very worthwhile event. I'm already looking forward to next year. Jon Calvillo and Rick Vetter, Wisconsin’s district endorsers, picked players for both girls and boys to compete in Indianapolis for the 2nd Annual 10 and Under Shootout. Players endorsed were John Carswell, Matt Lynch and Nick Allen for the boys, and Madeline Ecker for the girls. Jon Calvillo had a tough time finding players to play the event for the girls as they were many who declined to play, ended up with only sending one player for the girls. However, she did the best of the group, reaching the semi-finals, losing to the #2 seeded player. Lynch reached the round of 16’s losing to the #1 seed, Carswell lost in the round of 32’s. Allen, who lost in the first round, reached the final of the compass back draw before losing to a highly ranked player from Indiana. The Wisconsin Tennis Association Junior Development Committee (WTAJDC) is committed in the development of our junior tennis player at all stages of their playing years. The programs described below are designed to enhance the performance of the District’s top players at the local, sectional, and national level. The provided training opportunities from these programs are above and beyond those received in a player’s existing personal program. Bringing Wisconsin’s most talented juniors together to practice and train with one another, under the guidance of the District’s top coaches and professionals, will significantly benefit our junior players as they push and challenge each other to new heights. The WTA Northern Wisconsin Player Development Program (NWPDP) targets the top ranked 11-16 year olds residing in the northern half of the state, enabling these juniors in to train and practice with each other. The program consists of three Sunday sessions all being held at Western Racquet & Fitness in Green Bay. Each session is under the supervision of USPTA teaching professionals. This group focuses on the age range of 8 to roughly 11 years old and juniors that just below the Area Training Center team. This group will meet for 2 hours a session, from November through March, with a total of 5 practice sessions during this time period. Each session will deal with the developmental areas that they are going through at this age. Some of these areas will be focusing on fitness, sports science, mental toughness, stroke development and most importantly sportsmanship. This also the level that implementing parental education is a priority. This group will remain the same as in the past years. This group will be the top 12 to 14 age group players. Continuing to increase the effectiveness of this group’s development. 50 hours of training from September through January, totally 5 weekends a year (10 hours per weekend). Increase in the education base for the parents as changes are always happening in junior tennis. The opportunity for these players to get together and practice is important. Bringing together the best older juniors to practice together. This is a component of junior development that is missing with this group. Once they have gone through the CTC, this will continue to provide the opportunity to continue their development as a group. Group will meet for 3 hours a session, for 5 practice sessions from November to March. Their education will continue with the latest is sports science, fitness, psychology on court practice, match play, and collegiate tennis preparation. - We will use the most recent recorded results available to us at the time of selections. -Alternates will be selected based on ranking. -We will take the top 12 boys and the top 8 girls to make 20 students in all..
- We will select based on state tennis rankings only. -We will take the top 16 boys and the top 16 girls to make 32 students in all. If you have any questions or concerns, please contact Andrea Calvert-Sanders, USTA/Midwest Section Director of Junior Tennis or Greg Boyd, USTA/Midwest Section Ranking Coordinator. Click on the tournament name link and click the	“Click here to register on-line” link. As you are aware, we are not publishing a 2009 Junior Schedule booklet. Please click here for the searchable schedule. We ended up in our bracket tied with both Ohio Valley and Southeast Michigan for the top spot. However, through a tiebreaker (percentage of sets won) we came out on top for the right to play Chicago for the championship. Going into the finals I felt we had a great chance to win but giving everything we had to get there caused us to come up short.